Home » Magazine » Books » Who Killed Gautama? Sheela Reddy	March 08, 2010 00:00 IST Who Killed Gautama? Seven years ago, when Buddhist scholar and former monk Stephen Batchelor embarked on a search for the real Siddhartha Gautama, rooting through over 6,000 pages of the Pali Canon—the oldest set of texts on his teachings, which provide glimpses into his social and political world—perhaps he didn’t even dream of the Buddha that would emerge from his research. Far from the picture we have of Siddhartha as a prince who grew up in a palace, who renounced it all and became the Buddha, attracting the rich and powerful as well as hundreds of monks and nuns by his teachings, until one day he just lay down and died, Batchelor’s portrait of the Buddha “is not that simple”. In his new book, Confessions of a Buddhist Atheist, to be out in the US early March, this author of eight other books on Buddhism claims the Buddha was a man whose teachings were regarded by his contemporaries as not only radical, but “queer” enough for him to be denounced by one of his own former disciples as a “fake”, who not only managed to win the patronage of the three most powerful political figures of his time, but was worldly enough to survive in the midst of court intrigues, murders and betrayals, effectively quelling a rebellion within his own flock before he was done in by the ambitions of his own family. But it is Batchelor’s findings on the Buddha’s last days that are the most startling: in the last 10 months of his life, Batchelor says, the Buddha, old and ailing, saw his two main disciples die, one of them brutally murdered, and was forced to flee with a handful of loyalists from all the three political bases he had spent a lifetime building up, until he was possibly poisoned to death by one of his many rivals, leaving a pretender to take over the community after an intense power struggle. Some 15 years after they met, the tyrant-king Pasenadi wed into the monk’s family. But the Shakya clan opted for dark deception. The Buddha, according to Batchelor, owed his exile—and eventual death—to the same king who had lifted him to the heights of power: King Pasenadi of Kosala. According to the records, the king—the monarch of the most powerful kingdom north of the Ganges—and the Buddha—the son of a chieftain in one of the kingdom’s rural provinces—met for the first time when they were both about the age of 40. Hearing of his renown as a teacher, the king paid a visit to the Buddha’s retreat outside his capital city of Shravasti. At first sceptical, Pasenadi was soon won over by the Buddha, and asked to be accepted as his follower. “This was a—if not the—key moment in Gotama’s career,” writes Batchelor: with Pasenadi’s support, Gautama’s tenure in Shravasti was assured, and for the next 25 years, he spent every rainy season here in a grove gifted to him by a rich admirer, giving most of his discourses. Pasenadi, according to the references that Batchelor so painstakingly culled from the Pali Canon, was a paranoid tyrant given to impaling his enemies—imagined or real—on stakes. His friendship with the Buddha, which lasted for the next 25 years, seems to have had little effect on Pasenadi. “The only time he is seen to benefit from Gotama’s instruction is when he follows his advice to go on a diet,” writes Batchelor. From “a bucket measure of boiled rice” he reduces his intake to “a pint-pot measure” and becomes “quite slim”. Nor did the friendship improve the king’s suspicious nature, even when it came to the Buddha himself. For example, in one of the countless plots to discredit him by rival groups of ascetics, the Buddha was accused of sexual impropriety with a female renunciant called Sundari. When Pasenadi’s men found her body hidden not far from the Buddha’s hut, nothing could persuade the king of his teacher’s innocence. Fortunately, the king’s spies soon discovered the plot to discredit the Buddha. Some 15 or more years after they first met, the tyrant and the monk turned from friends into relatives: hoping for a male heir, Pasenadi decided to marry from the Buddha’s homeland, Sakiya or Shakya. The king approached the Buddha’s cousin, Mahanama, who had taken over the governorship of Shakya after the death of the Buddha’s father. It was a signal honour for the Buddha, but there was a problem: the notoriously proud Shakyans refused to allow any pure-blooded woman to marry outside their clan, forcing Mahanama to send to the king the illegitimate daughter he sired through a slavewoman, passing her off as a noblewoman. It was a deception that, Batchelor says, was not just dangerous and foolhardy, but would lead one day to a bloodbath, and the Buddha’s exile from Kosala. It’s impossible, points out Batchelor, the Buddha wouldn’t have known of the treachery, considering his close relations with all the main players. There’s a misconception, according to Batchelor, that the Buddha cut off all ties with his own community in Shakya after he left home. On the contrary, the Buddha returned to Kapilavastu after his enlightenment, reconciled with his family, and some of his most important followers were, in fact, his cousins, including Devadatta, who subsequently tried to overthrow him, Ananda, who memorised all the texts, and Aniruddha, who was present at his death. As a result of the deception, Batchelor writes, the Buddha “was placed in an impossible situation”: to reveal the situation would have put his life’s work in jeopardy, costing him the support of his most powerful patron, and to remain silent would have made him appear complicit in it. The Buddha chose silence, but he was no doubt aware of the precarious nature of his tenure in his Kosalan headquarters in Jeta’s grove. When Pasenadi heard of the Shakyans’ treachery, he vented his fury on his wife and son, stripping them of their royal positions, cropping their hair, and returning them to the condition of slavery. It fell on the Buddha to plead with the king on their behalf. He prevailed for the moment, but his idyll in Jeta’s grove was over. From then on, Batchelor writes, the Buddha was on the run, losing one by one all the three strongholds from where he spread his teachings. In Rajgir, the Magadhan king Bimbisara, his first royal patron, was forced to abdicate in favour of his son Ajatasattu, who imprisoned and then starved his father to death. At the same time, cracks began to appear within his own monastic community. His cousin Devadatta, who was also Ajatasattu’s mentor, plotted to overthrow the Buddha. Some of the texts say Devadatta tried to assassinate the Buddha by dropping a big boulder on him, and sending a wild elephant in his way. But the passages that give the most information about Devadatta say he tried to persuade the Buddha to step down on grounds of age. The Buddha dismissed the proposal decisively, saying: “I would not even ask Sariputta and Moggallana (his most indispensable and senior-most monks) to head this community, let alone a lick-spittle like you.” Till the very end, Batchelor says, the Buddha was adamant about not appointing a successor, stating that his teachings were his only successor. Having failed in his bid for power, Devadatta then walked out of the community, taking a sizeable section of the monks along with him. But eventually, the Buddha’s two senior-most followers, Sariputta and Moggallana, healed the schism and persuaded the renegade monks to return to the fold. There were other cracks within the community: the Buddha’s former attendant, Sunakkhatta, a nobleman of Vaishali who had left the monastic order, denounced him in the parliament of Vaishali as a “fake”. While the Buddha received the news with his usual calm, it was clear that he was losing favour even in Vaishali. That’s probably why, reasons Batchelor, the Buddha didn’t stay in his usual place during his last retreat in Vaishali, but in a village outside the city walls by himself, telling his monks to go and find lodging in the city for their support. Frail and elderly, the Buddha suffered yet another blow in the last months of his life: both Sariputta and Moggallana died within two weeks of each other—the latter brutally murdered, according to the commentaries, by the supporters of Jains, who saw the Buddha as a great threat to their own survival. Despite the bitter quarrels for his legacy, Buddha did not appoint a successor. Till the end, he said his teachings were his only successor. For the Buddha, Batchelor points out, his last few months were dogged by a sense of failure—the society in which he’d worked a lifetime spreading his teachings was erupting into violence. The new king of Kosala, Vidudabha, was invading the Buddha’s homeland and the Buddha was powerless to prevent the massacre that ensued, with the royal troops being ordered to kill every Shakyan they see, “sparing not even infants at the breast”. So he headed south for Rajgir, where Ajatasattu was planning to cross the Ganges and invade the Vajjian republic, despite the Buddha’s advice to the contrary. An exhausted and sick Buddha then wound towards home again, in Kapilavastu, accompanied by less than half-a-dozen monks of the many hundreds of followers he had in his heyday. And when he stopped at the town of Pavi, 75 miles from home, instead of the hospitality of the rich and powerful he had always enjoyed, he ended up at the house of a butcher or blacksmith. Batchelor puzzles over this passage included in the Pali Canon: why did the Buddha prevent the others from eating the pork? Did he suspect it was poisoned? He had no shortage of enemies, Batchelor reasons—Pava was not only in the Kosalan province adjoining Shakya, but was also a shrine to his principal rival, Mahavira, who is said to have died there a few years previously. Only a few months ago, his senior-most disciple Moggallana had been killed by hired assassins of Mahavira’s followers. But what’s the point in killing an old man who is already dying? Batchelor points out that the best revenge the Buddha’s enemies could have taken on him was to kill not him but Ananda, his faithful attendant. Ananda was the only one left after the death of Sariputta and Moggallana to have memorised the entire teachings of the Buddha. “If you killed Ananda, you killed Buddhism,” points out Batchelor. “By insisting that he alone be served with the pork and the leftovers be buried, the Buddha prevented Ananda from eating it.” The Buddha “hastened his own death”, according to Batchelor, “in order that his teaching would survive”. But the monk for whom the Buddha laid down his life ended up being upstaged by a relative outsider even before his cremation pyre was lit. 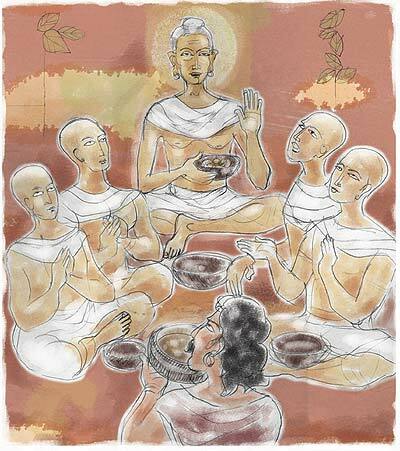 Mahakassapa was a Brahmin from Magadha who became a monk towards the end of the Buddha’s life. He arrived with a large group of monks just before the pyre was lit, and insisted that the cremation not take place till he too had paid his last respects to the Buddha.